There is no one more adored... Everyone knows that the Lady High Priestess Evelyn is virtuous and noble, one of the leaders of the rebellion against the unjust usurper, as well as a gentle healer who channels the powers of the gods to help the sick and injured. There is no one more despised... Orrin Blackhart, the Scourge of Palins, is renowned as an evil man. As the war leader of one of the usurper's supporters, he has killed many and has stood by while the sorceress he serves created an army of the undead. White Star is a sequel to last year’s Dagger-star, a fantasy romance set in the same world as Vaughan’s excellent Warlands Trilogy - Warprize (2005), Warsworn (2006) and Warlord (2007). 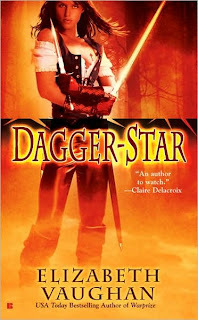 Dagger-star was the story of the sellsword Red Gloves, who fell in love with Josiah and helped save Palins and place the child queen Gloriana on the throne. White Star continues the story on the heels of the events of Dagger-star. Evelyn, High Priestess and aunt to the Queen has been kidnapped by Orrin Blackhart, the commander of the evil Sorceress Elanore’s forces, for her to exact revenge. Only Orrin learns that Elanore is dead and with her death his misplaced loyalty dies also. In order to save his fellow soldiers and people of the Black Hills, he offers terms of surrender and the war concludes. Now Orrin is the captive and must stand trial for his war crimes. Elizabeth Vaughan has a deft touch at building dramatic tension by careful pacing and putting her key characters in dire jeopardy on frequent occasion. Of course this would all be for naught if we did not care for our main characters. Both Lady Evelyn and Orrin Blackhart are fascinating; polar opposites in social status and by personal circumstance. Their mutual attraction becomes abundantly clear but the obstacles for any possible relationship are seemingly impossible. Seeing how this star-crossed romance plays out keeps you on the edge of your seat wondering how they can possibly achieve their HEA. 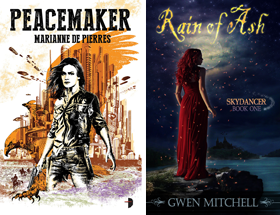 Thorough but not over-whelming world-building contributes to the engaging feel of this fantasy universe. Events and politics of the previous book play a role in the story but frankly, because the story is driven more by the romance and the action, you needn’t worry about political motivations if you haven’t read the previous book. And there is plenty of action in White Star. Lady Evelyn intervenes on Orrin’s behalf at the bequest of her Goddess, asking a boon of her Queen and saving Orin from execution. Orrin’s one chance at redemption for his crimes and an opportunity to win Evelyn’s favour is to purge the lands of the Black Hills of the hordes of revenants (zombies for urban fantasy fans) created by Elanore during the war. If Orin is successful he may also earn a pardon for his soldiers. A lot is at stake. There is a mystery here too because the zombies should not have continued after Elanore's death, but they have and in fact someone seems to be making more. Fantasy fans will appreciate the many well choreographed fight scenes of both the magical and traditional variety. White Star demonstrates that heroes come from the unlikeliest of places and that of course love conquers all. Plenty of engaging secondary characters round out the cast, but Evelyn and Orrin are center stage and a very compelling couple. White Star releases in bookstores today and readers of fantasy romance are in for a treat. If you have never read the Warlands trilogy I encourage you to give it a try also. I look forward to the next story in the Palins saga and I am going to go out on a limb and guess that it will be Queen Gloriana’s story. I thought White Star was okay, but it didn't grab me like Vaughan's other books. Interesting plot with the walking dead though. Zombies seem to be the in thing. KB I would tend to agree although I do think this was a strong romance. Coming from being an SF&F reader I must admit I liked the Red Gloves story more - after all who doesn't like a female mercenary/assassin. It was the Warlands Trilogy that put Vaughan on my reading radar. I really enjoyed Chronicles of the Warlands, though I still have to read book 3. I also liked Dagger-star quite a bit. (I also have a fondness for the female assassin, and there aren't enough stories about them!) Thanks for the review. I've got to get this one! I would love to see the young queen (?) get her own story. I really did enjoy Dagger-Star though. Love the red gloves! Hoping that Keir and Lara will have a fourth book. Hey Renee if you like female assassin/sell-sword stories try Lilith Saintcrow's Steelflower. KB Elizabeth Vaughan tells me that the next book may feature Bethral and Ezren! I also would love another book in the Chronicles sequence. Oh that sounds awesome! Can't wait! LS does that kind of character so well. Renee not sure if there will be a sequel to Steelflower. Lilith seems to have so many projects on the go all the time which is a good thing.